The Food Safety Modernization Act will impact most growers in New Jersey. 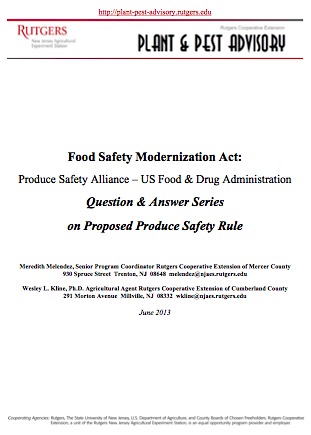 Over the past weeks, we have posted the Questions and Answers for each of the conference calls focusing on subparts of the proposed Produce Safety Rule of the Food Safety Modernization Act on the PPA Food Safety section. For your convenience, the Q&A’s have been collected into a single PDF.